Stepping in poo is a frequent occurrence when you have a dog or a puppy, and it made me think of this amazing TEDx talk about gratitude I just watched. The talk—Gratitude, Gifting, and Grandpa—was by John Halcyon Styn, who happens to live in my neighborhood. 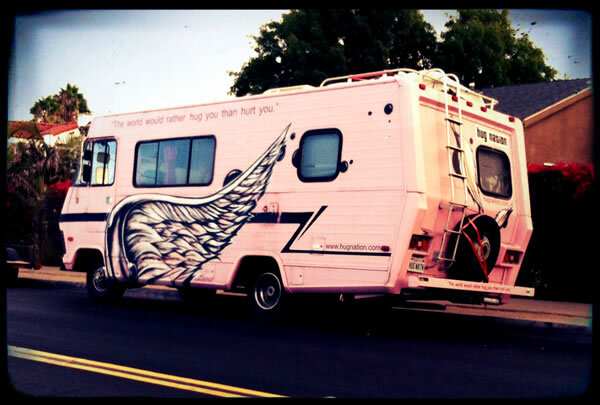 John drives this Hug Nation RV and is a regular at Burning Man. He, his significant other, and their chihuahua all sported bright pink hair and/or accessories, and we used to see them at dog park often enough that we nicknamed them The Pinks before we knew who they were and connected them to the RV. I was completely blown away by John’s talk, and felt a little TEDx curator envy, wishing I had been the person lucky enough to put him onstage at our event, TEDxSanDiego. The part of his talk that grabbed me was this phrase, “Cone or crap?” John says that throughout our lives we have a metaphorical ice cream cone in one hand while our other foot has just stepped in dog crap. It’s all about where we put our focus. I had just cleaned up the yard today, and was rejoicing that Daisy’s super-soft stools were greatly improved. Then I walked into the house, sat down, and started smelling something… poopy. I looked down at my shoe. Bleck. As I headed outside to clean off my shoe, I caught myself thinking, “Wow, I’m so lucky she got over her diarrhea! What a mess that would have been!” The shoe cleaned up easily, there didn’t seem to be any poop tracked through the house, and I realized that my natural inclination (after many years of intentional meditation on the positive) was to focus on the cone. 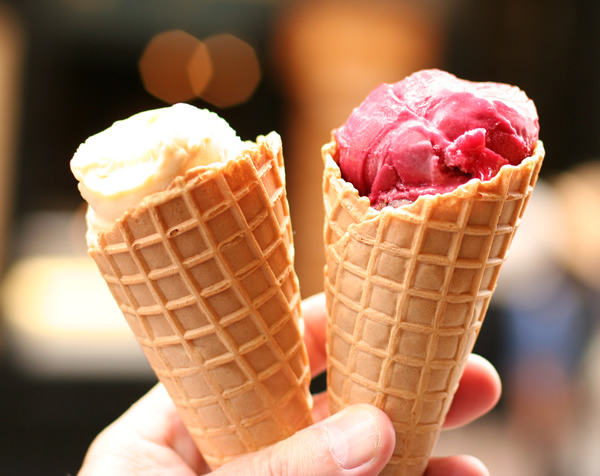 How have you made the choice for Cone? Thank you for posting this! I’m going to share this because it is SO good! Just love grandpa with pink feather wings on! Thanks Kelly! It’s definitely right up your alley. I’ve been fortunate to avoid stepping in poo for a while, but next time I do, I will have to remember this post. I’m glad your dog is doing better. I had a “crappy” time with my own dog’s digestive system a few years ago so I know how that can be. I’ll take a cone, please. Love that photo of the cones. And love your courage in posting the crap pic on your recipe blog. You did, indeed, make your point. The cones were a really happy memory. We went to France for my 50th birthday and it was soooo wonderful. Thanks for commenting! I am always looking for ways to be grateful. Most of the time it’s not too difficult, but stepping in dog poo would put me off my game a bit. Thanks for a great post. I know, life gives us some great challenges sometimes. Right now I feel like I have crap IN my cone. How bad is that? Oh well. Tomorrow is another day. And focusing on gratitude instead of crapitude is the right way to go. I just wish I could make myself do it right now. Chloe, I know exactly how you feel! Sometimes that’s just the reality. Hope this post lightened your day just a little. Thank you Marjorie. You are such an example of lifting up the positive in life. Cone! I love that picture of the ice cream, not the sneaker! 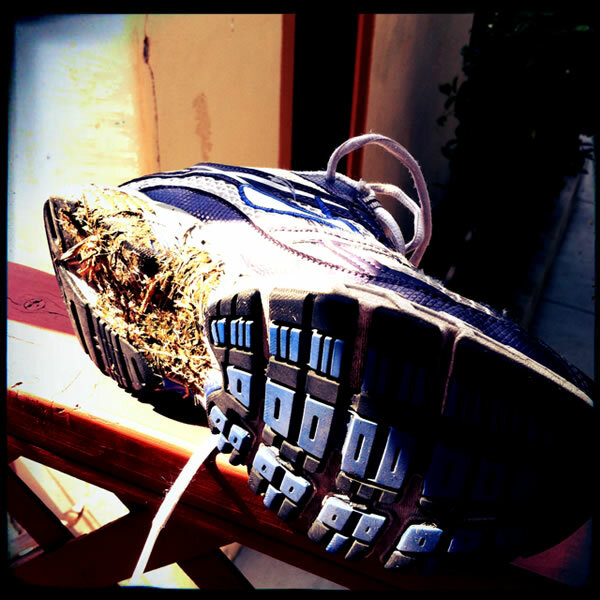 Yes, I did hesitate about posting the sneaker picture on a FOOD BLOG… but I hoped it made my point. You DO consistently choose the cone. Don’t miss this GREAT and SHORT video about gratitude! I try to listen to it everyday! Thanks Laura Lee. I appreciate you stopping by.